Product Hunt launches businesses successfully — scroll to the bottom for our key takeaways! Hi, I’m Neil, the CEO of Ramp (we’re trying to make the process of buying custom t-shirts for your team quicker, smarter, simpler and more transparent), and we recently spent three days with a significant presence on the front page of one of the greatest platform for promoting services in Technology. I’d like to share with you what happened, and how we’ve benefited. 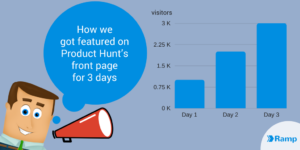 You can read a million and one blog posts about how to “win” on Product Hunt. This isn’t one of those. This is just putting some simple, honest numbers around what happened to us. I can’t be sure whether our success was down to our, ahem, genius or dumb luck. Or a mix of both. 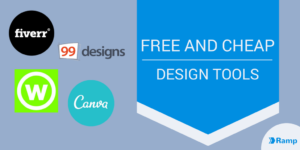 Before you get started, bear in mind that creating a logo or artwork shouldn’t be a quick job, especially when you’re going to use it for your t-shirt design. 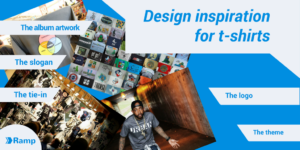 Think about how you want to represent your brand and whether what you’ve created fits with your style. After all, this will end up adorning most of your merch. An instantly recognisable logo or a clever piece of eye-catching artwork can help you stand out from the crowd. 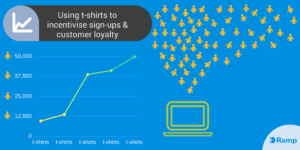 Here at Ramp we’re starting to see more and more startups realize that free custom t-shirts incentivise customer loyalty. Somehow they get people using their product. Everyone loves t-shirts, and everyone loves free stuff. So this seems like a no-brainer, right? We wanted to get to the bottom of what was driving this, and if it was effective. We spoke with Wil Benton, co-founder of one of our favourite new startups, Chew*, as well as Hugh Hopkins, Product Manager at realtime analytics company GoSquared. When you’re designing artwork for your merchandise, especially if you’re creating something for an event or group, it’s likely your designs will include text and, for that, you’ll need to choose a printing font. You might not have given this much thought until now — after all, they all pretty much do the same thing, right? Actually, no. 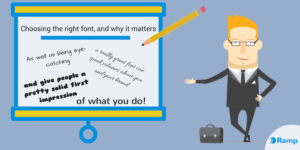 As well as being eye-catching, a really great font can speak volumes about you and your brand and give people a pretty solid first impression of what you do. Choosing the right one is pretty important then, but with literally thousands out there it can be an overwhelming business. So, we’ve put together a few tips to help you on your way. So, you’ve been tasked with organising the t-shirts. 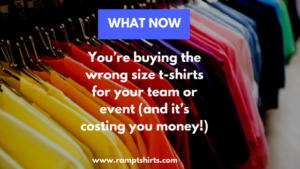 Team t-shirts might be needed for a charity fun run, a team-building away-day, or for a conference. Or you might have come up with a great idea for a cheeky slogan that you think people might buy from you in their thousands, or you might be a band on tour. “So, which sizes do you want”?